Growing up in Bombay and spending most of my summer breaks in Goa, I have had more than my fair share of curries. My Mum and my Aunt were great cooks and both could whip up a mean curry with great ease. So whether it was a meat (Chicken, mutton, beef or pork), seafood (fish, prawn or crab), lentil or vegetable curry, they were all really good. The best part is, they could do a lot of this without looking at a recipe. Now I haven't reached the 'no recipe' stage for some of the more intricate curries, but I do know a thing or two about them. So, a while ago, when I saw this episode of Poh & Co, where Poh (one of my favorite TV chefs) whipped up a Nonya (a type of Malaysian) Chicken Curry, both, my husband and I knew we had to try the recipe out. The recipe does call for a few specialty ingredients, but the first time I made this curry, I didn't have them and so I left them out. Even then the curry was a great one. But I knew I wanted to try the recipe with all of the ingredients. So I picked up the Pandan leaves and the Shrimp Belachan at a local Asian grocery store and made the curry again. This time with all the ingredients. The result was a mind-blowing curry. Now I don't often refer to a curry as mind-blowing. A cake, maybe, but never a curry. But this curry is all that, and then some. It is one of my favorite chicken curries. And today I'm going to show you how I make mine. I have altered the method a tiny bit, to make the recipe more convenient and I hope you try this out the next time you want to make a chicken curry. If you've never made a curry before, don't let the idea scare you. It is easier than you think. I've put together a video to walk you through the process. 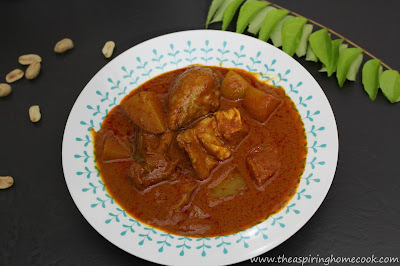 Let's move on the the detailed recipe for this Nonya Chicken Curry. Take the skin off the chicken, cut into pieces, trim the fat off and set aside. Deseed the dried chillies and soak them in hot water till they've rehydrated and softened. In a dry pan, on medium heat, roast the coriander, cumin and fennel seeds till fragrant. Take them off the pan and set aside to cool. Using a blender or food processor (you can also use a mortar and pestle if you dont have one), grind the roasted coriander-fennel-cumin seeds mix, drained red chillies, onion, garlic, belachan and turmeric to a fine paste, adding a little water as needed. Heat oil in a large pot / pan over medium heat. Add the star anise, cinnamon and cloves and let them fry till fragrant about 20-30 seconds. Add the spice paste (rempah) to the pan and saute for 6-8 minutes till the sauce is very fragrant. Tear the pandan leaves into 3 strips lengthways and knot them together. Add the pandan and curry leaves to the spice mix. Add the chicken to the pan and stir to coat with the spice paste. Saute for 1-2 minutes or till the chicken pieces start to look opaque. Add the potatoes, salt and sugar. Add a little water to thin down the sauce a little to reach the desired consistency. Let it come to a boil. Add the slit birdseye chillies, lower the heat, cover the pot and simmer till tender. Check after 5-7 minutes, add more water if needed, stir to make sure the curry doesn't stick to the bottom of the pan. Cover the pot and continue cooking till the chicken and potatoes are cooked. Serve hot with rice. 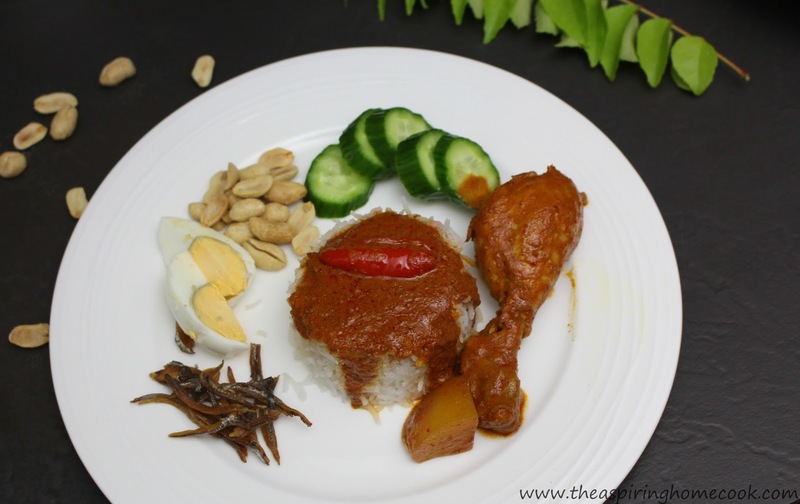 I tried to serve it up like a Nasi Lemak, but with plain rice instead of coconut rice. I added some fried baby anchovies, peanuts, boiled egg and some cucumber slices. 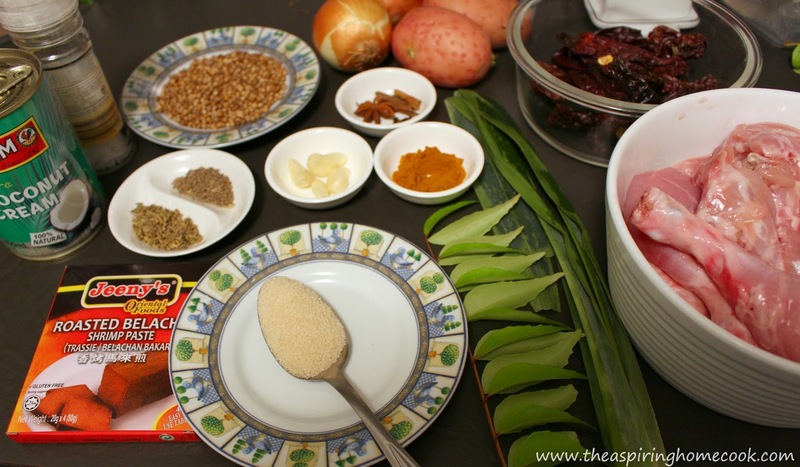 This curry also goes really well with roti or even bread. If you can get on hands on some Roti Canai, even better.